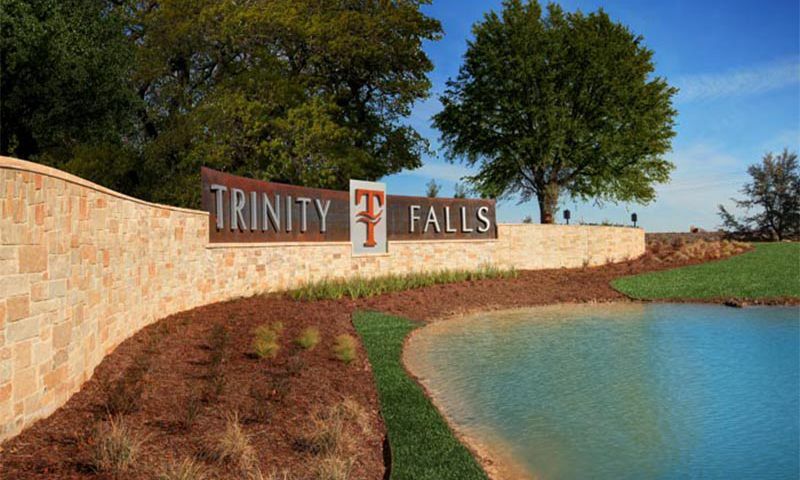 Del Webb at Trinity Falls is an up-and-coming 55+ community in McKinney, Texas. As Del Webb's third active adult community in the Dallas-Fort Worth area, this age-restricted neighborhood will consist of 537 single-family homes upon completion. Located within the larger master-planned Trinity Falls division, this community will include amenities such as a 10,000 square-foot private clubhouse, resort-style swimming pool, and over 20 miles of walking and biking trails. With abundant amenities, attractive homes, and a convenient location, active adults looking for new homes for sale in McKinney, Texas might find everything they’re looking for in Del Webb at Trinity Falls. Residents of Del Webb at Trinity Falls will have private access to the neighborhood’s own age-restricted amenities plus all of the amenities throughout Trinity Falls. The community will boast its own 12-acre amenity area with a 10,000-square-foot clubhouse, a fitness center, a resort-style swimming pool with lap lanes and lounging areas, a hot tub, and courts for pickleball and bocce ball. Active adults will also enjoy The Club, the clubhouse for all Trinity Falls residents. The Club features a social room that opens to a sunset terrace, an open-air pavilion with an oversized fireplace, and an amphitheater overlooking a lake. Outdoors, the amenities continue with a beach-entry swimming pool, kids splash area, and disc golf course. All residents of Trinity Falls get to enjoy the 20 miles of hiking and biking trails that weave through scenic creek landscapes and wooded areas. Neighborhood parks, playscapes, and a dog park also border the trail system for a total of over 450 acres of open spaces. Trinity Falls also plans to develop a canoe and kayak launch. Del Webb began construction of Del Webb at Trinity Falls in 2018 and plans to build 537 single-family homes across 127 acres. Homes will range from 1,306 to 2,605 square feet with two or three bedrooms, two to three bathrooms, and attached two-car garages. With 10 home designs available, active adult homebuyers can choose the styles and features that best fit their lifestyles. Many homes will feature open floor plans with central kitchens, sunlit morning rooms, and guest suites. Features in some homes will include spacious covered back patios, oversized pantries, and breakfast nooks. Active adult homebuyers interested in Del Webb at Trinity Falls can soon tour the homes for themselves. Del Webb plans to open six model homes in Summer 2019 and develop an on-site information center by the end of 2019. Del Webb at Trinity Falls plans to hire a full-time lifestyle coordinator to organize clubs and events. The clubhouse will serve as the central hub for activities where neighbors will gather to enjoy their hobbies. The community will offer cooking classes, computer classes, cards games, and line dancing, as well as a full social calendar of lifestyle clubs and special interest groups. Del Webb at Trinity Falls will be located on the banks of the East Fork of the Trinity River just northwest of McKinney, Texas. This location approximately 39 miles north of Dallas will put residents in easy reach of daily needs and fun opportunities. Residents of Del Webb at Trinity Falls will be close to any daily conveniences they need, including Kroger, WinCo, a Walmart neighborhood market, and Trader Joe’s. Residents will also find CVS Pharmacy and the local McKinney Pharmacy. When dining out, restaurants such as Hutchins BBQ, Harvest, JB Legacy BBQ, and Cadillac Pizza Pub can be found nearby. When residents are looking for entertainment options, they’ll find them at Cinemark Movies 14, iPic Theaters, Main Event Entertainment, and Strikz Entertainment. Residents who want to get outside will find plenty of options close by. Golfers will find multiple courses to play nearby, including Oak Hollow Golf Course, El Dorado Country Club, Hank Haney Golf Ranch at Westridge, and TPC Craig Ranch. There are also multiple greenspaces and parks to choose from, including Natural Springs Park and Inspiration Park. The nearby Heard Natural Science Museum and Wildlife Sanctuary offers 289 acres of nature trails, gardens, and exhibitions to explore. Lavon Lake, Lewisville Lake, and Lake Ray Roberts all provide ample opportunities for boating, fishing, hiking, horseback riding, and swimming. Del Webb at Trinity Falls is also close to multiple health care providers, including Baylor Scott & White Hospital, Methodist McKinney Hospital, and McKinney Medical Center. Residents who want to visit nearby metropolitan areas are in luck. Del Webb at Trinity Falls will be an approximately 45-minute drive to Dallas and an hour drive to Fort Worth, providing easy access to everything the cities have to offer. With direct access to US-75, residents will be able to commute to the Dallas North Tollway, Highway 121, or George Bush Tollway. When it’s time to get away, Dallas Love Field Airport will be about 35 minutes away while DFW Airport will be about 40 minutes away. 10,000 square-foot Clubhouse - Coming Soon! Check back soon for more information on the lifestyle in Del Webb at Trinity Falls. The Garden series features single-family homes that range from 1,306 to 1,474 square feet. The homes include two or three bedrooms, two bathrooms, and an attached 2-car garage. The Classic series features single-family homes that range from 1,710 to 1,984 square feet. Homes in this collection include two or three bedrooms, two bathrooms, and an attached 2-car garage. The Estate series features single-family homes that range from 2,334 to 2,605 square feet. The homes in this collection include two or three bedrooms, two to three bathrooms, and an attached 2-car garage. 55places.com is not affiliated with the developer(s) or homeowners association of Del Webb at Trinity Falls. The information you submit is distributed to a 55places.com Partner Agent, who is a licensed real estate agent. The information regarding Del Webb at Trinity Falls has not been verified or approved by the developer or homeowners association. Please verify all information prior to purchasing. 55places.com is not responsible for any errors regarding the information displayed on this website.